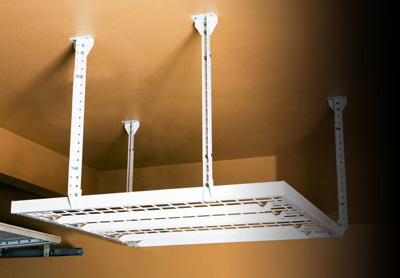 Slide-Lok Overhead Storage is made of strong and durable steel. The height is adjustable and will fit any storage need. Modular in design, Slide-Lok's Overhead Storage allows you to buy one unit or multiple units to suit your storage needs. This easily installed solution will not interfere with garage doors or openers, utilizing space that you never knew you had. 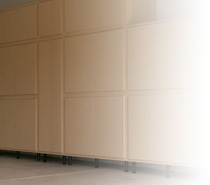 Slide-Lok is proud to offer both the 48" x 48" and the 96" x 48" Super Pro ceiling storage units. Adjustable Height from 24" to 44"
Two sizes available: 48" x 48" and 96" x 48"
When you purchase garage storage cabinets from Slide-Lok, you get the excellent service that you'd expect from doing business with the leader in the garage interiors market. Contact Us About Your Garage Storage Project! *TAX and S&H not included. Natural maple only. Cannot be combined with any other offer. Home Projects are fun and easy, especially with our inexpensive quality plywood cainets! Our storage cabinets feature a patented dovetail design that allows them to be easily slid together, just apply glue and mount to the walls of your garage, home, office, etc... Each cabinet comes with instructions to ensure you can easily assemble them. Our cabinets have limitless configurations, you can always add more at a later date, they're easy to mix and match to fit any storage need. To complement our plywood cabinet lines, we offer overhead storage racks and slat-wall and accessories! DIY cabinets! To match our storage lines, are concrete garage floor coatings. Our coating systems range from Polyaspartic, Epoxy, Acrylic, and hybrid coatings. Decorative concrete coatings are very popular in restaurants, kitchens, garages, warehouses, showrooms, waiting rooms, etc... You can get a single color glossy coat, a metallic pigment decorative "swirls" coating, or our famous chipped coatings that have chips/flake/fleck in the second coat. Followed with a clear coat (anti-slip additives extra) you get a stylish floor. Contact us for more details.